The first 747-100s were built with six upper deck windows (three per side) to accommodate upstairs lounge areas. Later, as airlines began to use the upper deck for premium passenger seating instead of lounge space, Boeing offered a ten-window upper deck as an option. 747-200 – The demand for longer range aircraft with increased payload quickly led to the improved −200, which featured more powerful engines, increased MTOW, and greater range than the −100. The 747-300 features a 23-foot-4-inch-longer (7.11 m) upper deck than the −200. The 747-400 introduced a new glass cockpit designed for a flight crew of two instead of three, with a reduction in the number of dials, gauges and knobs from 971 to 365 through the use of electronics. The type also features tail fuel tanks, revised engines, and a new interior. 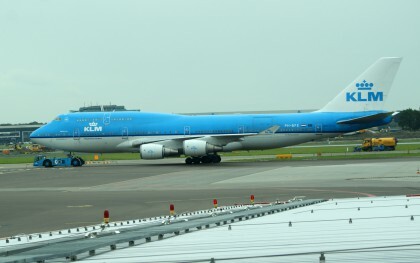 The 747-800 uses the same engine and cockpit technology as the 787, hence the use of the “8”. The variant is designed to be quieter, more economical, and more environmentally friendly. The 747-8’s fuselage is lengthened from 232 to 251 feet (70.8 to 76.4 m), marking the first stretch variant of the aircraft. Power is supplied by General Electric GEnx-2B67 engines.